Balaji Wafers is looking to become a pan-India brand, and that's where the challenge could be. Lunch time for the Viranis, founders of the Rs 1,000-crore Balaji Wafers, is sacrosanct. The three founders, Bhikubhai, Chandubhai and Kanubha, along with their sons Mihir, Pranay and Keyur, respectively, get together over homecooked Gujarati meal every afternoon at their corporate office on the outskirts of Rajkot. Often, the sons seek business advice from the elders. The goal of the younger Viranis, says Keyur, is to make Balaji a national brand. "We are net savvy and are more in touch with consumer preferences and production best practices," he says. "Our endeavour is to be as contemporary as possible but not at the expense of diluting the brand value that our parents have created." The second generation of the Virani family is clearly beginning to take centre stage. The foray into healthier snacks is the brainchild of the younger Viranis. The company recently invested about Rs 250 crore in setting up new machinery at its 85,000 sq. metre fully automated factory on the outskirts of Rajkot, where it would make a range of baked, multigrain snacks that are perceived to be healthier than traditional fried snacks. It has also acquired land near Indore to set up its third factory, which would be operational in 2016. With this, the company would be spreading its wings to northern India, from its traditional foothold of Gujarat and Maharashtra. The younger Viranis are aware a bet on healthier snacks by bigger companies - PepsiCo's Aliva and Parle Product's Smart Chip, for instance - failed to lure customers. Keyur, who looks after research and development, says the R&D team is trying to come up with a product that is tasty as well as healthy. Pranay, who takes care of business development, says Balaji is reducing oil consumption even in its traditional offerings such as potato wafers and namkeen. "But the value addition is only up to the level where the taste doesn't get compromised," he says. The second generation also feels the need to get some strategic investment into the business in order to take it to the next level. The Rs 1,000-crore company was in advanced talks with PepsiCo and Kellogg's last year, but both deals fell through. "Our idea of strategic partnership was to get access to global best practices... but all of them wanted a majority stake in the business which we were not ready to part with," says Keyur. The company has also been evaluating private equity deals. However, Managing Director Chandubhai isn't keen on roping in strategic investors. He says strategic partners would only want profits. "They will never grow the business with the same passion as we have done," he says. Despite its lofty ambitions, Balaji Wafers remains regional in its thinking. For instance, it doesn't believe in spending much on marketing and advertising. While PepsiCo spends seven to eight per cent of its snack revenue (around Rs 6,000 crore) on advertising and hires Bollywood superstars such as Ranbir Kapoor to endorse its brands, Balaji's ad and marketing spends are negligible. Chandubhai's mantra for growth is to pump in as much muscle into distribution - the company has a network of 600 dealers in Gujarat and Maharashtra. He feels that marketing is all about understanding consumer needs and offering great products. This strategy has certainly worked. It not only has more than 70 per cent market share in Gujarat, but has also managed to displace PepsiCo's Lays in Maharashtra from leadership position in the last five years since it has entered the market, according to industry estimates. 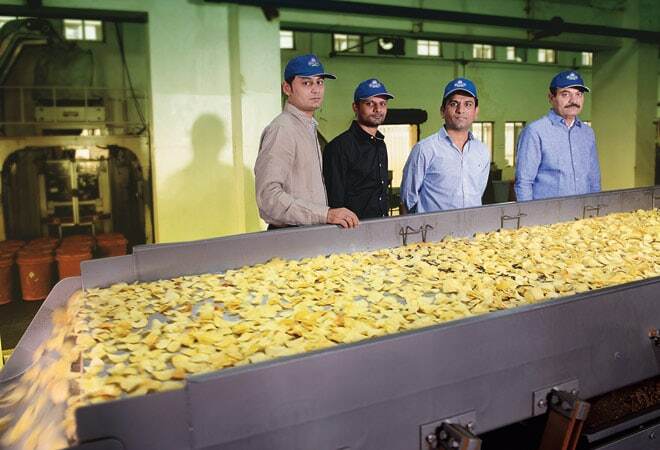 Balaji Wafers has over 60 per cent market share in potato chips in the state. The biggest positive rub-off of having a distribution-only model is the company's ability to offer more at the same price. While a Rs 10 pack of Lays or Bingo has around 13 grams of chips in it, a Rs 10 pack of Balaji contains 20 grams chips. However, Keyur says they may be soon forced to cut down on grammage as potato prices rise. The company is also increasing its dependence on snacks. The contribution of wafers has come down from 70 per cent to 40 per cent. "Snacks gets us higher margins than wafers, so we are trying to balance our portfolio," says Pranay. Increasing focus on snacks is, indeed, a logical step forward, points out U. Krishna Rao, the head of the snacks business at Parle Products. 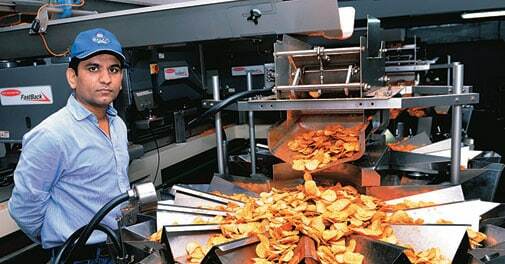 Rao says that in the Rs 9,000-crore snack business, the growth of potato chips has decreased to single digits while the namkeen segment is growing 20 per cent annually. "The erratic potato pricing as well as consumers not wanting to consume too much potato wafers has affected sales," says Rao. The company is also not too open about hiring professionals. Apart from the head of production, Nishikant Bapat (formerly with PepsiCo) and the R&D head, all the other employees holding managerial roles have been groomed by Chandubhai. "Professionals don't stick on for long, all the people I have personally groomed are still there with me," he says. The Virani family's traditional mindset has definitely worked so far. But will this mindset work when the company is at the cusp of taking a leap to the next phase of growth? Its biggest challenge would be attracting professionals as grooming local talent in a new market would, indeed, be tough, says a senior partner in a leading consulting company. From a brand valuation perspective, Raghu Vishwanath, Managing Director of brand valuation company Vertebrand, says Balaji may not get incremental valuation as its mindshare has not kept pace with the market share. "Brand valuation is a combination of mindshare and market share. In Balaji's case, the mindshare is negligible. Nobody knows about Balaji outside of Gujarat and Maharashtra," he says. "Regional brands such as MTR could take it up to a point till they sold out. Balaji has to invest in brand-building to survive in the long run." The company also has to deal with the challenge of coming up with snacks tailor-made for local tastes. Ganthia, a snack which sells like hot cakes in Gujarat, may not necessarily work in UP. The younger Viranis claim that they are fully prepared for the challenge. Despite being a competitor, Rao of Parle Products is confident that the Viranis will be able to establish themselves in the new markets. "They completely cornered the market leader in Maharashtra when they came in five years ago and became a leader with huge shares. Balaji's entry into North is surely an alarm bell for the larger snack companies."